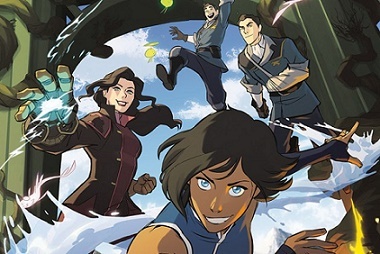 The new Legend of Korra graphic novel series, adapted from the Nickelodeon TV show, will be available in summer next year from Dark Horse Comics. The popular TV show, a sequal to The Last Airbender, debuted in 2012 and centered on the adventures of “bender of the four elements” Korra. It has garnered a considerable fanbase. This three-part series will be entitled The Legend of Korra: Turf Wars and will be an official continuation of the television series. After leaving the spirit world and returning to Republic, Korra and Asami discover more politics involving the human vs. spirit conflict. The trouble is worsening as a property developer is planning to turn the spirit portal into an amusement park. A second storyline dimensions circles around the triads, who are engaged in fighting on the city’s precarious borders. Nickelodeon TV series co-creator and executive producer Michael Dante DiMartino is the author of the graphic novel series and the illustrations are by Irene Koh (Batgirl) and Heather Campbell. The Legend of Korra: Turf Wars is slated for release in June, 2017.